Safe mode is usually used when one tries to remove spyware or malware from their computer or are trying to troubleshoot and diagnose some issues with their machine. In Safe Mode, only some programs and files run as the operating system is getting loaded. Thus, making it easy to resolve issues, get rid of damaged drivers, remove viruses and complete other diagnostic tasks. Let us learn how to use Windows in Safe Mode. If you are using Windows 7/Vista/XP, the following instructions will help you use Windows in Safe Mode. The minute you power on your computer or restart it, tap the F8 key. Once the computer displays the hardware information and runs a memory test, you will see the Advanced Boot Options menu. Now, with the help of your arrow keys, select Safe Mode or Safe Mode with Networking. Then press, Enter. 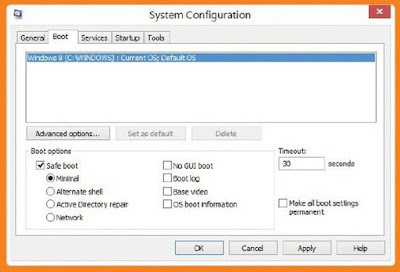 Once you are done with your tasks, reboot the computer and boot back your PC into normal mode. Windows 8 users need to go to the Windows 8 Start Screen and type Advanced. Now, you need to select the option that says Advanced startup options. It will take you to General PC settings. Scroll and select Advanced startup. Click on Restart now and Windows 8 will restart your computer into the Advanced Startup option menu. Select Troubleshoot and then Advanced options. Click on Startup settings. On Startup Settings click on Restart. Your computer will restart and show you a Startup Settings menu. You can start your PC in Safe Mode in Windows from this screen. You can either choose Enable Safe Mode, Enable Safe Mode with Networking, Enable Safe Mode with Command Prompt. Select according to the corresponding number option. You Windows will boot into Safe Mode version and ask you to login. Once you login, you will be using Windows in Safe Mode, with the word Safe Mode written in each corner. Thus, you have to follow these steps to use Windows in Safe Mode.